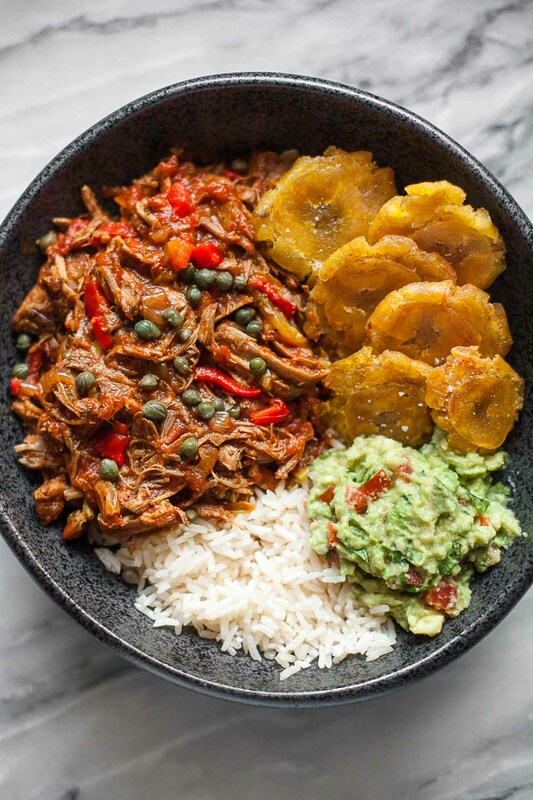 You are here: Home / Search for "pressure cooker"
Pressure cooker ropa vieja is a time-saving Instant Pot version of the traditional Cuban beef dish, and is naturally gluten and dairy free. There’s also a slow cooker version! This post is sponsored by Pomí in partnership with Honest Cooking. Have you tried ropa vieja? Don’t worry about the fact that the name is Spanish for “old clothes”–this is supremely delicious comfort food, with nothing old or ragged about it. To make this pressure cooker ropa vieja, beef is quickly seared, then cooked until tender in an addictive sauce made with Pomí tomatoes, bell peppers, onion, garlic, smoked paprika, and other spices. Next, capers, raisins, and pimiento peppers are added for pops of color, sweetness, and tart, briny flavor. The result is a dish so soothing and satisfying that Ben and I aren’t even close to being tired of it, despite having eaten three giant batches over the past two weeks. No pressure cooker? Don’t fret (but I do highly recommend the Instant Pot!). 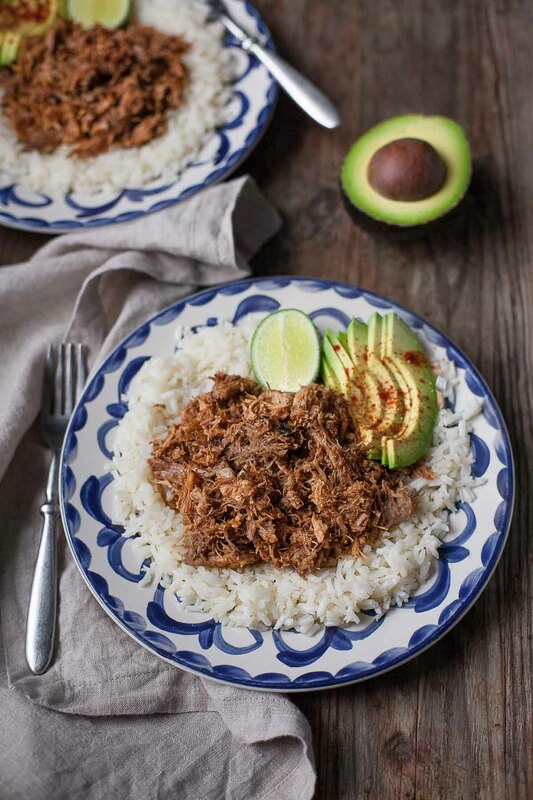 This ropa vieja is just as delicious made in a slow cooker. I was surprised to find the two versions indistinguishable in taste and texture, so it’s really just a question of how much time you have and which appliance you want to use. 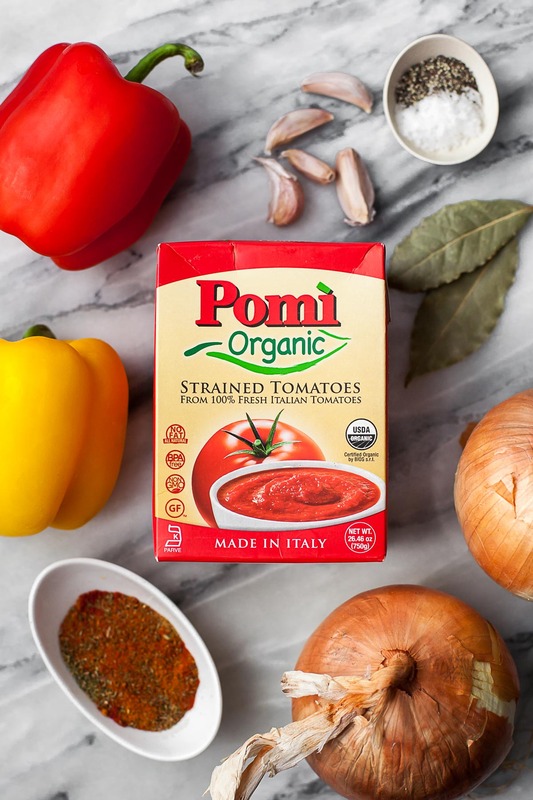 I used Pomí Organic Strained Tomatoes for this recipe. They’re similar to crushed tomatoes and provide all the great umami-packed flavor of fresh tomatoes grown in the Italian sunshine. (By the way, I also tested this recipe with Pomí’s chopped tomatoes and they worked great, too!) I love that they’re organic and non-GMO certified. This post is sponsored by Pomì. 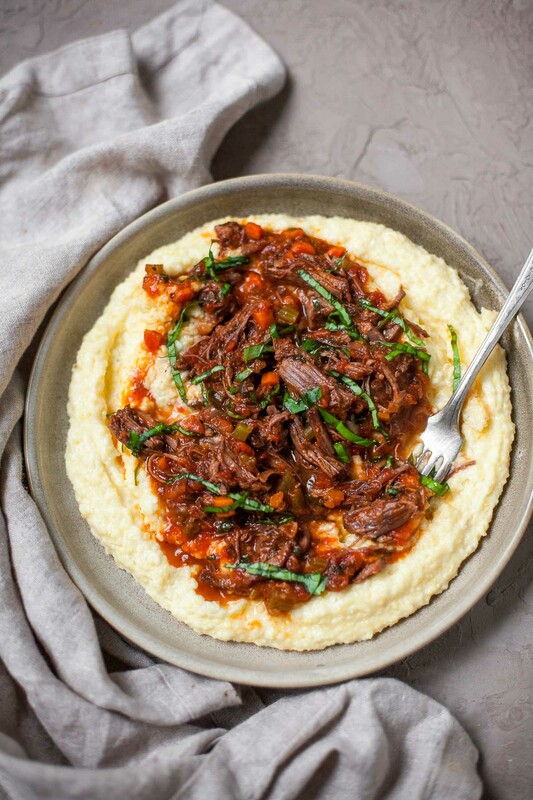 This easy Instant Pot Short Rib Ragu is packed with rich, hearty flavor and is perfect for cool fall nights. Enjoy it with pasta, spiralized veggies, or polenta. It’s officially fall, which means it’s time for warming comfort food dishes like this Instant Pot Short Rib Ragu. This meaty sauce gets its flavor from organic, 100% Italian Pomì strained tomatoes, a classic soffritto of onion, celery, and carrot, and of course, the short ribs themselves. If you haven’t tried short ribs before, you are in for a treat: after being seared and then pressure cooked to perfection in the Instant Pot, they shred into the most tender morsels of beef you’ve ever tasted. The sauce is finished with a handful of fresh basil for freshness, and a splash of heavy cream or coconut milk for creaminess if you’re so inclined. 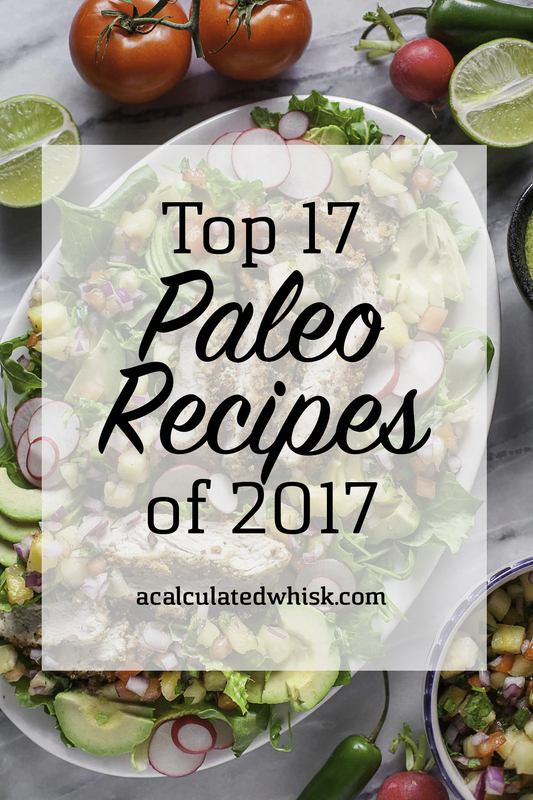 In case you missed them, here are my 17 most popular paleo recipes of 2017 based on number of views! Hope you give some of these a try in the new year. Happy 2018! What are you up to this month? Are you setting resolutions? Starting a Whole30? I’m not doing either one of those this year, but I am setting some goals, including business goals for the year and personal goals to exercise more, eat things that make me feel great, and make taking care of myself a priority. I’ve done or attempted a Whole30 every January for the past few years and learned a lot from each one, and now I feel ready to take what I’ve learned and outline my own eating intentions based on how I know I react to various foods. 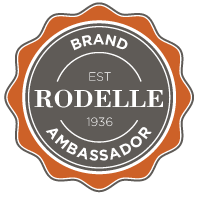 If you’re doing a Whole30, though, I have plenty of delicious recipes to share with you–check out the Whole30 section of my recipe index (it’s right at the top! ), two of my favorite roundups, 16 Whole30 Sheet Pan Dinners and 40 Whole30 Instant Pot Recipes, and my Whole30 recipes Pinterest board. I’ve also noted which recipes below from this past year are Whole30-compliant. 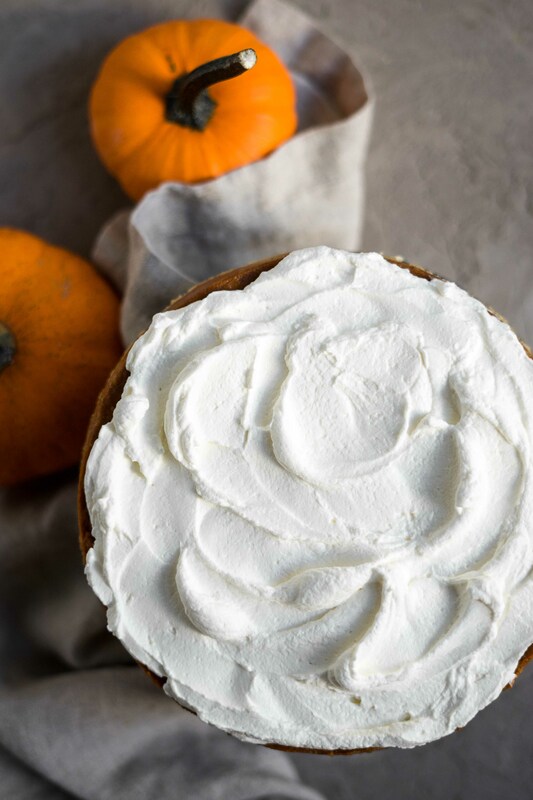 This grain-free Instant pot pumpkin pie is easy to make in your pressure cooker, and is the perfect size for an intimate holiday gathering. Recipe from Emily Sunwell-Vidaurri’s new cookbook, The Art of Great Cooking with Your Instant Pot. It’s time for an Instant Pot dessert! I recently took a little poll over on Instagram stories, and found that 74% of you have an Instant Pot. If you’re among the 26% that doesn’t have one yet, you should add it to your Christmas list–it’s my very favorite kitchen appliance of all time because of its cooking speed, ease of use, and versatility. It sautés beautifully, plus it does the work of a slow cooker, rice cooker, pressure cooker, and more. And now, we’re using it as a pie maker! This collection of paleo comfort food recipes will keep you warm and nourished all winter long! Looking for more delicious paleo recipes? 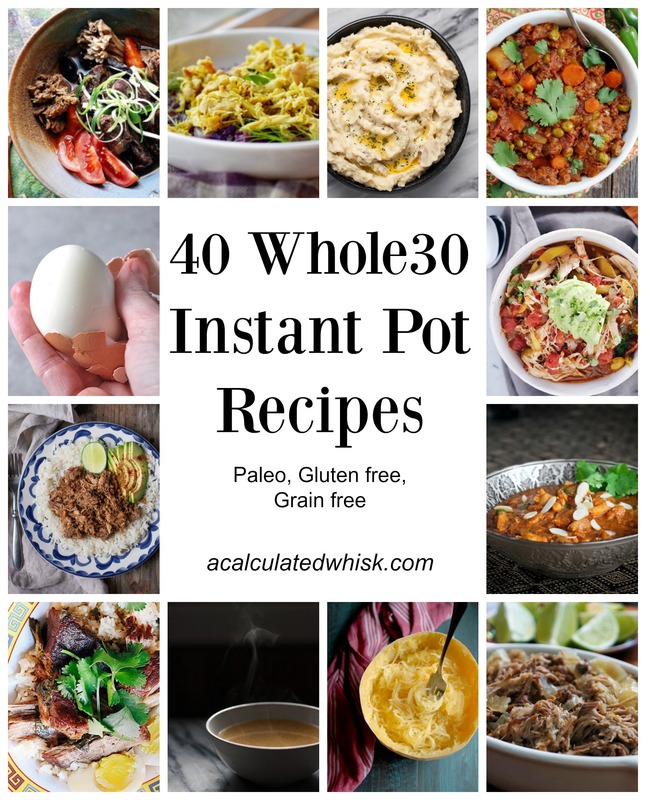 Check out my roundups of Whole30 Instant Pot recipes and Whole30 sheet pan dinners. Raise your hand if you could use some comfort food right about now! Between the cold weather and the seemingly incessant parade of Christmas treats, I’ve been craving healthy, hearty, hot dinners. 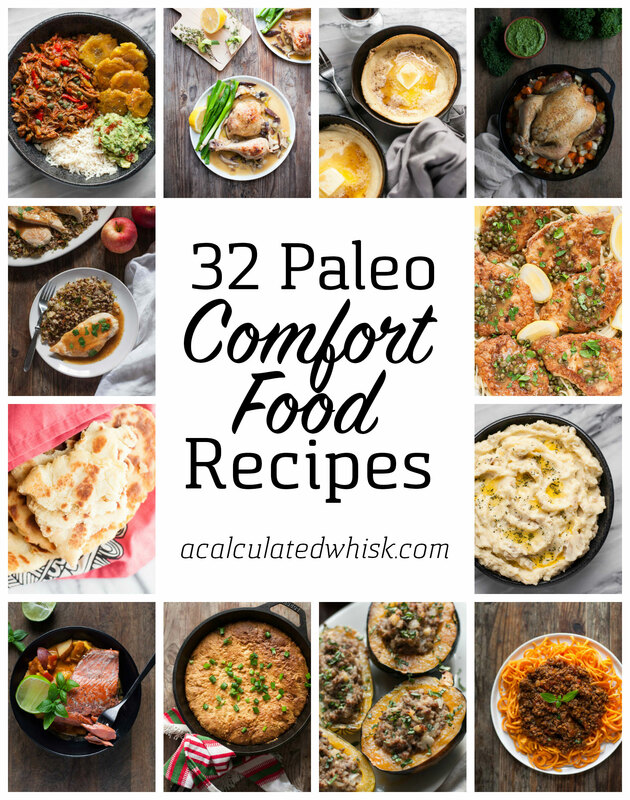 In case you have been, too, I put together this collection of my very best and favorite paleo comfort food recipes. Between all the cookies and the shopping and whatever else you’re up to, I hope you can find time to share some of these dishes with your family (or just make them for yourself!). Many of these recipes are great to make ahead and/or Whole30 compliant, so I’ve noted details like that below. Which one will you try first? Here’s to a healthy and happy holiday season filled with plenty of satisfying meals! 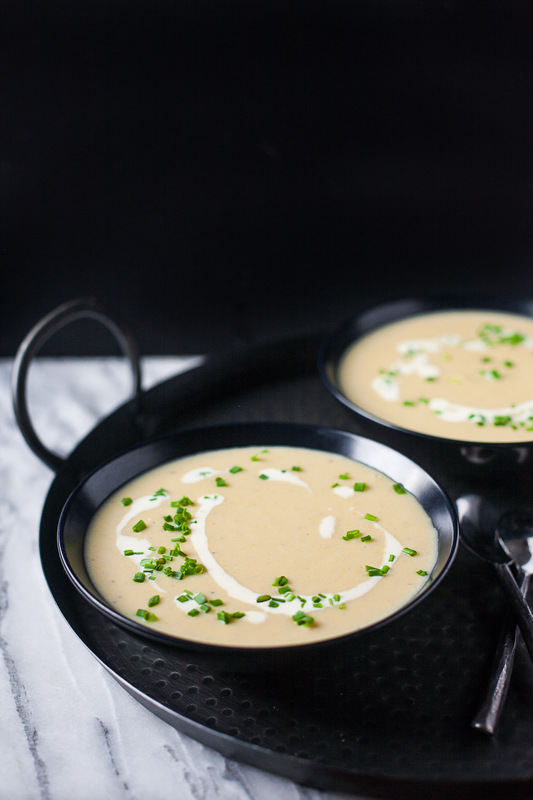 This Instant Pot potato leek soup is lightened up with the addition of cauliflower, and comes together super quickly in a pressure cooker. It’s also paleo and Whole30 compliant! It’s Day 1 of my January/February Whole30! Usually I start a Whole30 right at the beginning of January, but this year I had plans to help out with a styled wedding shoot and travel to Florida. I wanted to make sure I could eat some faux wedding cake and all the Cuban food, so I pushed my start date to today. I went to a great yoga class last night and made some mini frittatas (similar to these) to reheat for quick breakfasts, so things are going swimmingly so far. Tonight my Whole30 partner in crime Lindsey and I are making my shepherd’s pie with rutabaga, which is one of my favorite cold-weather meals of all time. 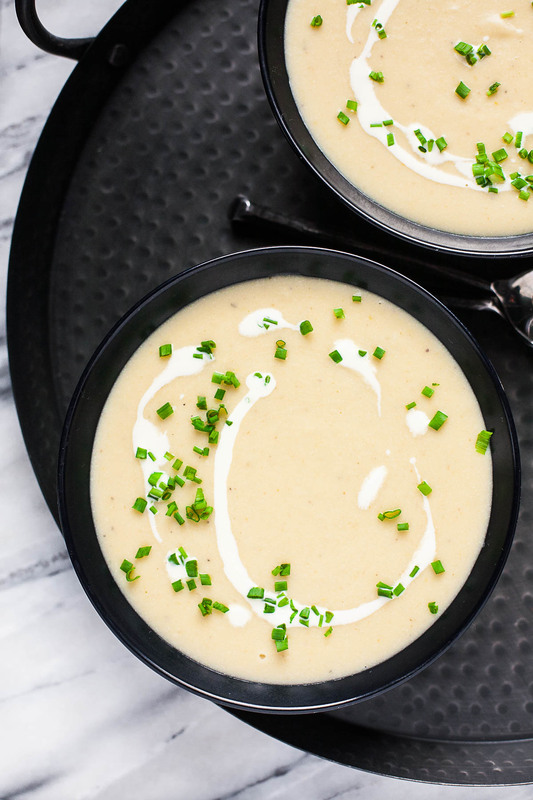 This instant pot potato leek soup is a great addition to my winter Whole30 repertoire. The base of the soup is half potato and half cauliflower, so you get the great flavor and creaminess of potatoes without the huge carb spike. Anyone suspicious of cauliflower will not be able to taste it! The leeks add wonderful savory flavor to the soup, which is further complemented by the grassy, oniony freshness of the chives sprinkled on top. Move over, slow cooker–you’ve been replaced! 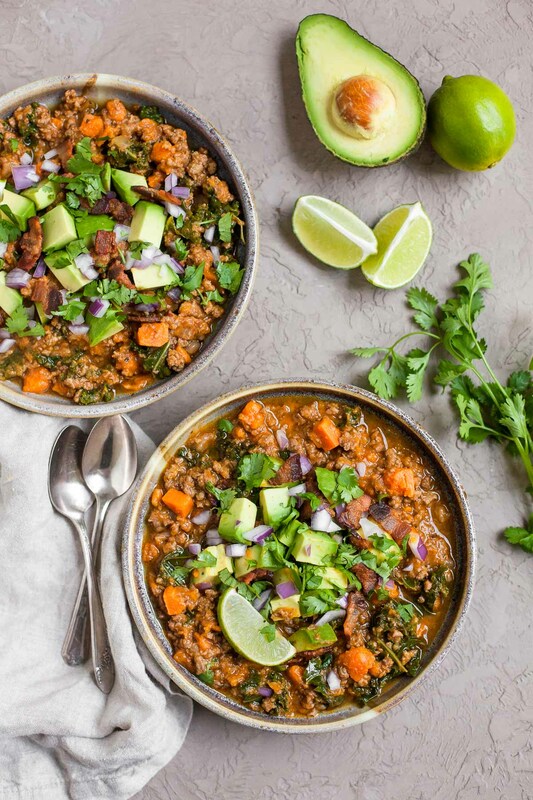 This roundup of Whole30 Instant Pot recipes will help you save tons of time and eat ridiculously well while meeting your nutritional goals. Looking for more Whole30 recipes? Check out these 16 Whole30 Sheet Pan Dinners. Also, there are over 80 Whole30-compliant recipes in my cookbook, Paleo Planet! If you don’t have an Instant Pot yet, you are missing out! This electronic pressure cooker has quickly become my number one kitchen gadget because it saves me so much time without sacrificing any flavor. I have this model, which is just $99 right now, but there’s also a new bluetooth version that looks pretty amazing. With the Instant Pot, recipes that take all day in a slow cooker are done in just an hour or two, which is perfect for people like me who don’t excel at planning ahead. It also has a sauté feature, so you can brown meats right in the pot before pressure cooking. And if you enjoy being able to have dinner simmering away slowly all day while you’re at work, worry not–in addition to high and low pressure settings, the Instant Pot also has slow cooker settings. It’s perfect for making rice, too, so you can basically replace your crockpot and your rice cooker with this one miracle appliance. It’s also a great steamer, and has settings for pasteurizing milk and making yogurt (I have yet to use those, but I like knowing they’re there). 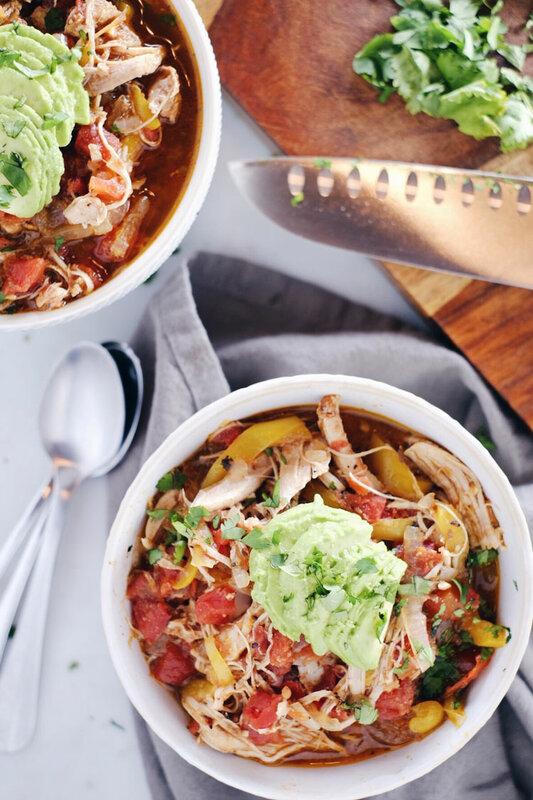 If you’re doing a January Whole30, these Instant Pot recipes will save you from food boredom while also saving you tons of time. Even if you’re not doing a Whole30, these healthful, real-food recipes are perfect for feeding you and your family any night of the week. Looking for even more Whole30 Instant Pot recipes? Find ten more right here! 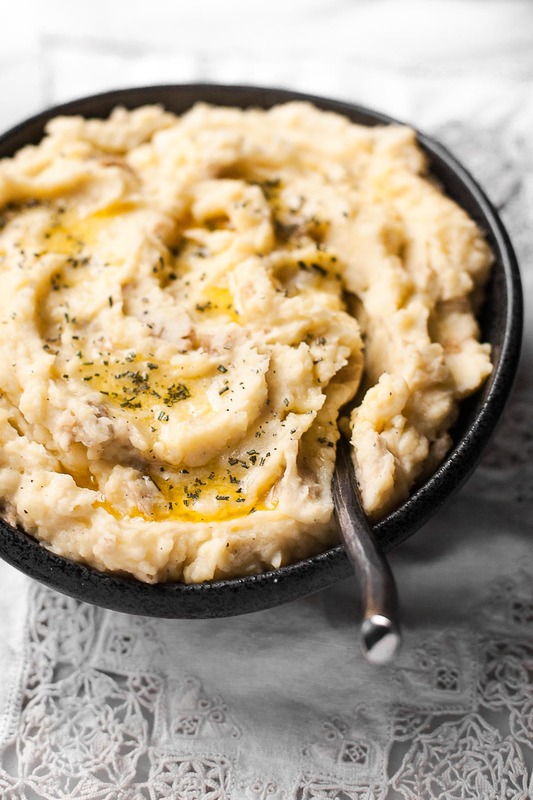 These easy Instant Pot mashed potatoes save time and are just as delicious as stovetop taters. There’s a paleo and Whole30 version, too! Ever since I got my Instant Pot last year on Black Friday, I haven’t had to wait for water to boil to make mashed potatoes and have pretty much forgotten about the stovetop version. The Instant Pot is just so much easier and faster–there’s really no comparison. The potatoes cook start to finish in about 20 minutes, and then I mash them right in the pressure cooker with a handheld potato masher. Done and done. There are two versions in the recipe card below–the version I normally make, and the version I make when I’m doing a Whole30. 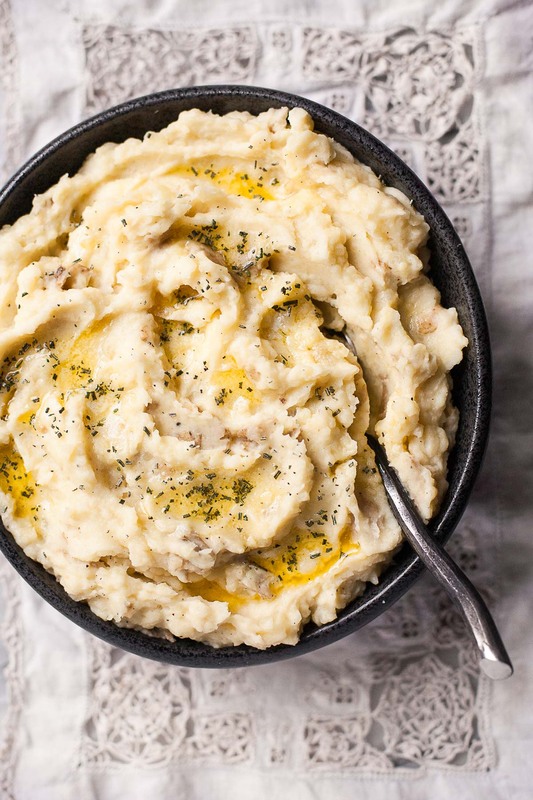 In my mind there’s really no question that the regular version is a little better, but the cream-free version certainly does the trick when I’m craving the comfort of mashed potatoes during a month of squeaky-clean paleo eating. In both versions the potatoes are cooked with chicken stock instead of water, which means you don’t have to drain them. It also adds flavor and nutrition. If you use bone broth like I do, your mashed potatoes will have a good amount of protein in them! The main difference between the two variations is that the Whole30 version calls for more stock since you won’t be adding cream later. It also calls for a little extra ghee to make up for that lack of cream. I always like to finish off my mashed potatoes by adding a little more butter or ghee on top, and in the winter I love to add some finely minced rosemary, too. In the warmer months, snipped chives provide a similar pop of color and freshness. 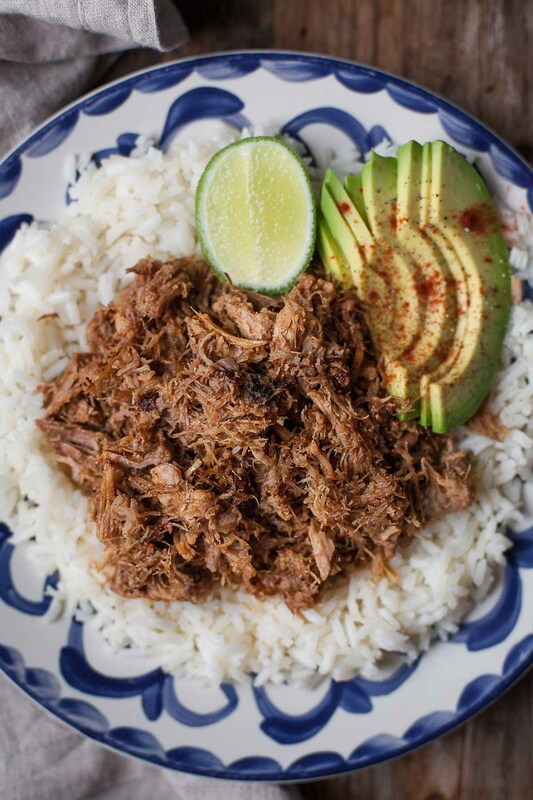 These easy five-ingredient Instant Pot carnitas are tender and juicy, with a great citrusy flavor. They are wonderful over rice, in tacos, in lettuce wraps, with an egg on top, or just plain! These slow-cooker carnitas lettuce wraps are one of my favorite dinners, and ever since getting an Instant Pot, I’ve been working on converting the carnitas recipe so it can be made more quickly. It’s not necessarily weeknight quick because it takes about an hour and a half to make, but that’s a lot less than the 8-10 hour slow-cooking time. This is perfect for whipping up on a weekend afternoon to have a stockpile of delicious meat for the days ahead. To make this recipe extra easy, I’ve streamlined the ingredients list. You only need five things (not counting salt, pepper, and water). Also, this recipe is made start to finish in the Instant Pot, without any broiling at the end or any other dirty pans. Carnitas are traditionally made on the stovetop like this, where they cook low and slow, often with spices and citrus juices. Eventually, all of the juices cook off, and the carnitas begin to caramelize and crisp up a little in the dry pan. When I make carnitas in my crockpot, I have to discard most of the juices and broil the carnitas after slow cooking to crisp them up and get that characteristic carnitas texture. With the Instant Pot’s sauté feature, though, I can cook off all of the liquid pretty quickly without using more than one pot. That means Instant Pot carnitas are just as easy as the original stovetop version, but much quicker. Instant Pot chicken stock is so much easier and faster than the stovetop version! 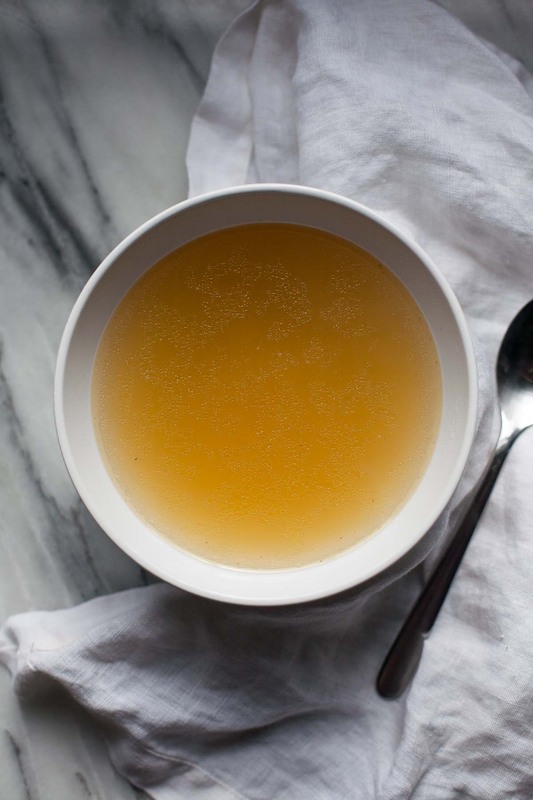 The finished stock is wonderful on its own or in any number of paleo soups, sauces, and braises. Looking for more Instant Pot recipes? Check out my easy mashed potatoes, ropa vieja, and five-ingredient carnitas (or see them all here). I’ve been talking about my weekly routine of roasting a whole chicken ever since the first wisp of cool air blew into Chattanooga in the fall, and I’m still going strong. Since buying myself an Instant Pot on Black Friday, though, the process of making the chicken bones into stock has gotten so much faster and more flexible. Here’s the before and after of all the bones, aromatics, and seasonings in the Instant Pot. I used carrot, celery, shallot, leek, parsley, bay leaf, salt, and pepper. 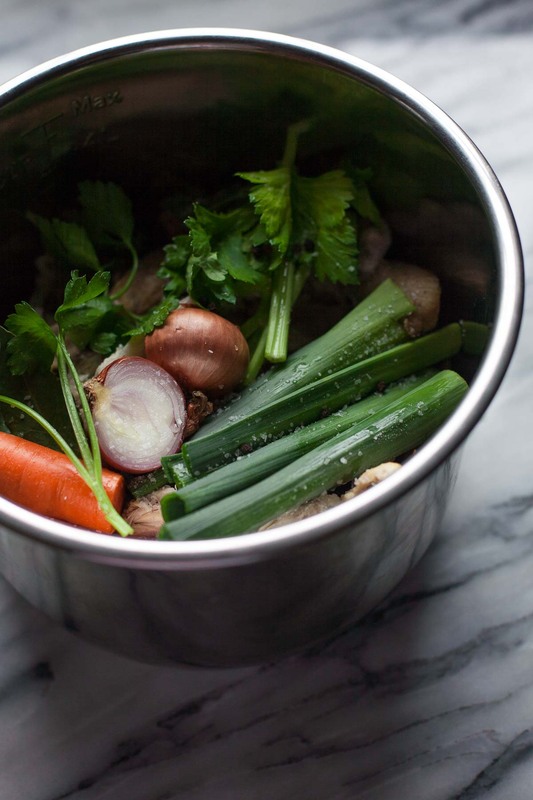 If you’re missing one or two of the vegetables, you can definitely still make a nice stock. You can also use a small onion if you don’t have shallots and leeks, but I love the extra-savory richness that they give to chicken stock! I’ve played around with also adding one or two smashed cloves of garlic, but have decided I prefer my stock without. This is in part because I like to have a steaming mug of it first thing in the morning when it’s chilly out, and I’m just not ready for garlic at breakfast time. Of course, if you want some in there, go ahead and add it! You can also play around with adding a little bit of rosemary and thyme along with or instead of the parsley. 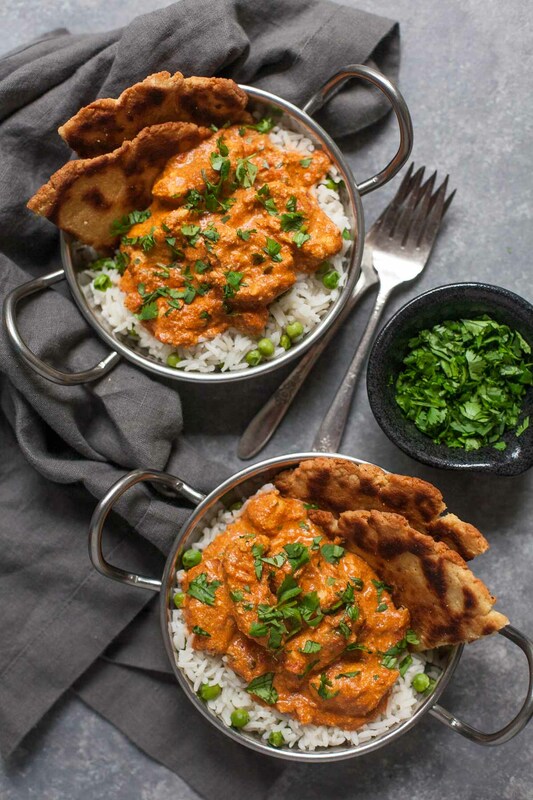 Chicken tikka masala is a favorite at Indian restaurants, but it’s even more delicious when made at home! Try it with my paleo flatbread. Who else is a huge fan of Indian food? I think if I had to pick just one cuisine as my very favorite, Indian would be it. I just can’t pass up all the layers of spice and flavor! And while it’s great to go out and enjoy dinner at an Indian restaurant, it’s even more fun (and even tastier) to make it yourself at home. Plus, your house will smell amazing!